First of all thank you so much for your encouraging comments on my last post about the 'grown up quilt'. Well I finally chose a better name for it and called it Tuscan Hills because the soft earthy colours reminds me of Tuscany. 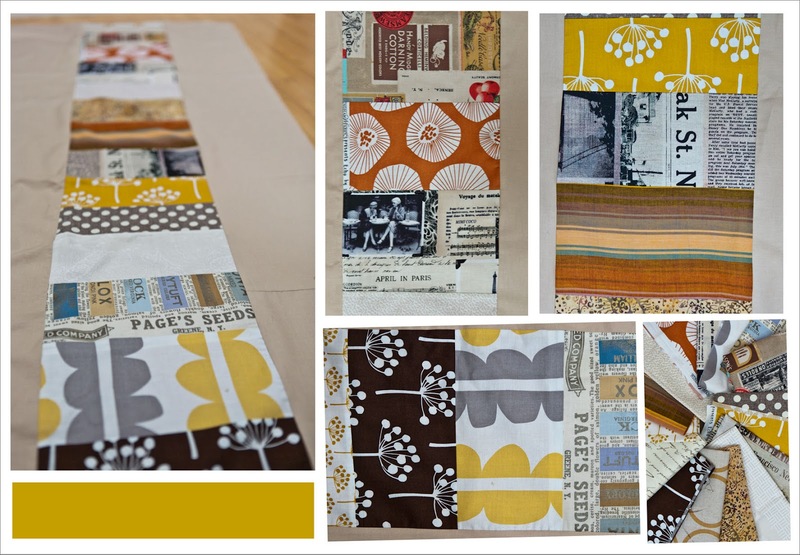 I followed my idea and pieced one long strip that I placed on the right quarter of the quilt leaving an expanse of negative space that will have to be jazzed up with quilting. I love that strip of print within the mass of Khaki and each of the prints is really special to me, in particular the newspaper prints I scattered in between. I haven't made a decision in terms of quilting yet other than that it will be dense quilting either in continuous circles or some form of straight line pattern. Oh this has the makings of being awesome! I love the prints, and I love that there's so little of each! Its so subtle - looks fab. This is amazing - the fabrics look brilliant together and really shine with the neutral background. Well done! Looking forward to seeing more! Hope it all works out without a hitch! It's gonna be a stunner! "Tuscan Hills" is a great name! It's going to be a beauty! !